the Addiction and Recovery Industries. Sober Network Inc., one of the oldest and most reputable companies in the addiction industry, responsible for advancing technology solutions for behavioral health markets since 2000. The Sober Network® is driven by its mission to help people: Get Sober. Stay Sober®. Since January 2000, Sober Network® Inc. has been the premier provider of innovative digital solutions and award-winning mobile apps which address the multiple and varying needs of the addiction & recovery industry. From the add icted population to all professionals involved in the recovery industry, Sober Network Inc.’s suite of technology solutions has a singular goal – to facilitate and ease the transition toward clean and sober living. Sober Network Inc. is comprised of different digital properties – each with their own focus on a different segment of the addiction & recovery industry. While we offer solutions for the addicted population, we also offer technology benefiting treatment providers, pharmaceutical and insurance companies, as well as for other stakeholders burdened by increasing costs seeking highly effective yet affordable solutions. We are proud of our suite of services which aid in assisting people with recovery from their addiction by locating initial counseling resources and treatment to aftercare. Our goal is to provide all people struggling with addiction access to a fulfilling and healthy lifestyle. Want to learn the What, When and Why of Sobercoin? 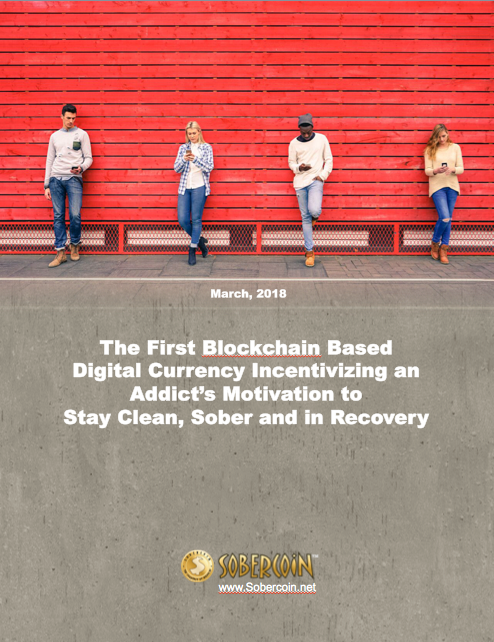 Sobercoin was designed to make a real difference in the access, success and sustainability of Recovery. To learn more download our white paper that outlines the marketplace and why it is the right idea, at the right time.